Now, we are not telling you to look directly at the sun. Those of you who are utilizing the practice of sun gazing feel comfortable doing it, but that does not mean it is for everyone. We are telling you to let the sun hit your skin in moderation and to feel the warm glow that you get from doing so. 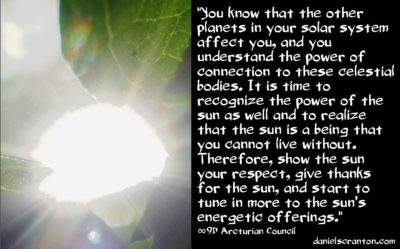 The sun is one of the major physical beings that you have supporting you, and the entire solar system is connected by it.